As October nears its end, we are looking ahead into the new year on the blog, as we bring you your sneak peek at artwork featured in our January books. From the Khazars of the 7th century to the Pacific Theatre of 1944–45, we've got some great plates to share with you! Let us know, which of the books are on your to-read list! The first plate we're featuring is from our Men-at-Arms series. The Khazars looks at the armies, organisation, armour, weapons and fortifications of the largest Jewish-ruled state in world history. In the background on the left rides a Western steppes nobleman (7th century) his general appearance and clothing look European rather than from a nomadic steppe culture, but his sword, archery equipment and horse harness show strong Iranian influence. 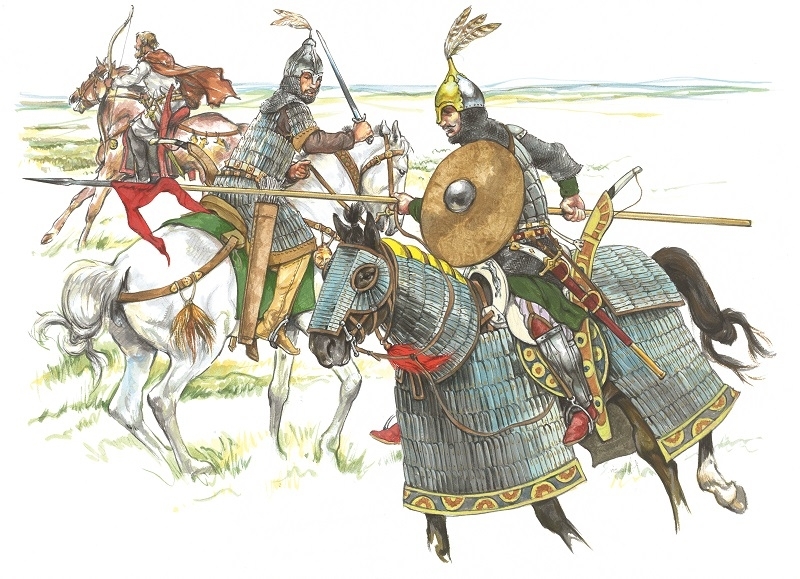 In the middle stands a Sabirian armoured cavalryman (6th–7th centuries).This Sabir (Savir) tribal warrior illustrates the sophistication achieved by the Khazars’ immediate predecessors north of the Caucasus. His substantial cuirass and upper arm defences are of iron lamellae laced with rawhide thongs. His archery equipment is of a form seen across most of the Eurasian steppes, while his single-edged sword is still straight. The final figure is of a Khazar warrior (7th century). Khazar wealth is suggested by the gilded front plate of his directly riveted segmented helmet. His full panoply consists of a single-edged straight sword with a curved hilt, in a brass-fitted scabbard with ‘D’-shaped projections for suspension; a spear with a two-tailed pennon; a leathercovered wooden shield with an iron boss; a composite bow carried unstrung in a brightly painted case; and a large fighting knife or khanjar perhaps made en suite with the sword. 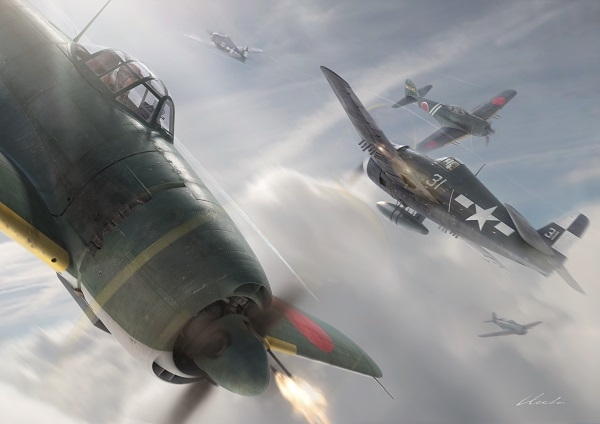 Our second plate is from Hellcat vs Shiden/Shiden-Kai, which looks at the US Navy's burgeoning force of carried-based F6F-3/5 Hellcats and the formidable Japanese Kawanishi N1K1/2 Shiden/Shiden-Kai, as the clashed during World War II. The plate here shows an engagement from March 19, 1945, when veteran aviators of the 343rd Kokutai saw combat for the first time in the N1K2-J. They dove on 20 Hellcats from VBF‑17 that were targeting airfields in the Kure area. The US Navy pilots in turn started to climb in their F6F‑5s in order to meet their opponents head on. Our final plate is featured in our upcoming Weapon book, Weapons of the Viking Warrior, which dispels the myths of the popular image, whilst considering the range of weapons that underpinned the Vikings' success. Here, two opposing shield-walls approach each other to fight in close order. Within this formation, the spear is the principal weapon. 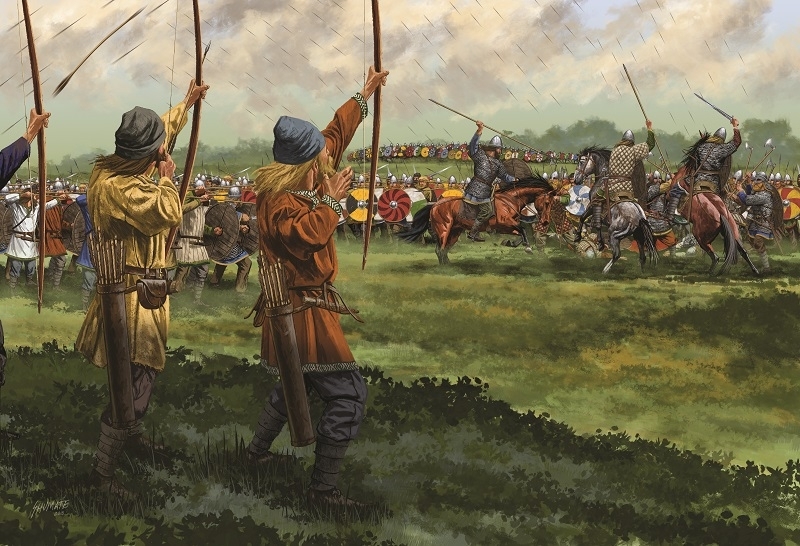 On the left of the scene, archers seek to disrupt the opposing shield-wall by loosing arrows into the enemy’s midst. Many of the warriors have only padded armour rather than mail, and the longbows of the period were heavy enough to penetrate this. On the right, a small number of mounted warriors are moving to turn the flank of the opposing shield-wall, again with the hope of causing the formation to collapse. To read more about these stunning pieces of artwork, pre-order your copies by clicking here.